where a[_] are real numbers and n is a positive integer. For example, the following are polynomials. Each element in the addition is called a term. For example, in -2*x^5 -4*x^3, there are two terms: -2*x^5 and -4*x^3. The constant in each term is called the coefficient of that term. For example, in the term -2*x^5, -2 is the coefficient. Each term is associated with a integer called the power or degree of that term. For example, in -2*x^5, the degree is 5. A polynomial is associated with a integer called the power or degree of the polynomial, which is defined to be the max of the degree of all its terms. For example, the degree of the polynomial -2*x^5 -4x^3 is 5. The concept of degree of a polynomial is important, because it gives us info about the behavior of the polynomial on the whole. We'll see it when we study the graph of polynomial. A polynomial can be plotted as to show its properties visually. 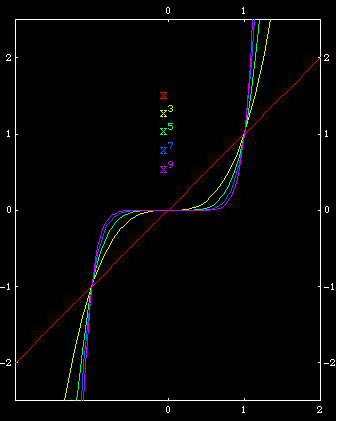 A polynomial is plotted as the curve “y==f[x]”. The concept of polynomial functions goes way back to perhaps Babylonians times, since for example as simple a need of computing the area of a square y==x^2 is a polynomial, and is needed in buildings and survey, fundamental to core civilization. The Pythagorean theorem x^2+y^2==z^2 is also a polynomial equation, and much basic number theory have been expressed algorithmetically in Greek or pre-Greek era. The modern concept of polynomial as a function of integer powers and their symbolic manipulation is developed in 1600s and 1700s. Finding solutions of polynomials as ready-made formulas is a spetacular chapter in the history of mathematics, culminating in the birth of Complex Numbers and Group Theory. 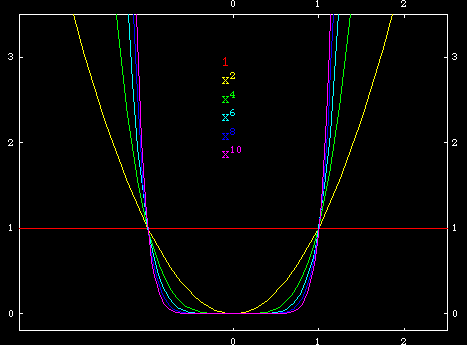 The graph of a polynomial b*x^n looks like a Parabola if n is even. Otherwise, it is s-shaped. These facts can be easily perceived if we look at the behavior of x^n for large values of n. If n is even, x^n is always positive even if x is negative. When n is odd, x^n is negative when x is negative. The coefficient b scales the curve vertically, and if b is negative, it flips the curve along the y-axis. Left: Even powered polynomial. Right: odd powered polynomial.